Although this isn't the biggest festival weekend in terms of quantity, it is big in quality. A number of established and anticipated events take place this weekend: Prater's Mill Country Fair, New Salem Mountain Festival, Ellijay Apple Festival and Oktoberfest at Chattanooga Market. » The annual Marsh House festival is set for Saturday, but under a new name: Autumn Rocks. This free event in LaFayette, Georgia, combines arts and crafts with a heritage festival. Tours of the 1836 Marsh House are given, Victorian games are played and Civil War re-enactors share the grounds with modern fun such as inflatables and local bands. » New Salem Mountain Festival is marking its 44th year of celebrating the creativity of regional artists. Faye Nichols says more than 100 artists will be exhibiting in this popular outdoor show that draws thousands of visitors over two days. In addition to those exhibits, a special Mountain Gallery is always held indoors at New Salem featuring some of the best work of each exhibitor. All proceeds from this sale go right back into the community, benefiting New Salem Community Center and New Salem Fire and Rescue. Visitors walk the grounds at the 2017 Prater's Mill Country Fair in Dalton, Georgia. More than 165 crafters and artists will show in this weekend's festival. » Prater's Mill Country Fair is also a fundraiser, begun by volunteers in 1971 to raise money to restore the historic 1855 mill and surrounding buildings. That grass-roots event has grown to more than 165 artists and crafters — 40 of those new this year — and 30 food vendors. Over the two-day event, cloggers and musicians will perform, and there will be dulcimer music by Pat Bryant and Steve Wixson playing rhythm bones on the mill porch. Wear comfortable shoes because this festival is so big, it's on both sides of Georgia Highway 2. 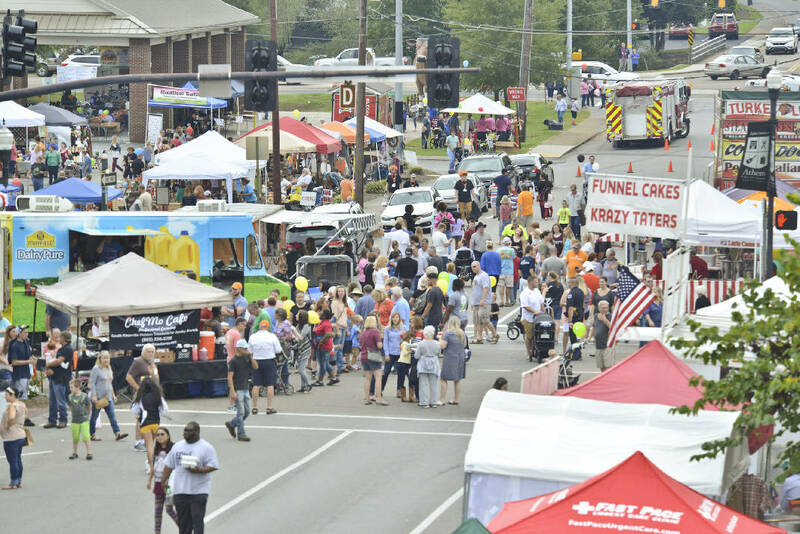 » If you're looking for small-town charm, head up I-75 to Athens, Tennessee, where Pumpkintown will be in full swing Saturday. The entire town square is decorated with hay bales, corn stalks tied with festive ribbons to light poles, and, of course, pumpkins. There is even Pumpkin Plinko on Jackson Street from 10 a.m. to 4 p.m.
Meredith Willson says there will be live music on stages at the courthouse steps, Market Park pavilion and Downtown Diesel on White Street. The Scott Crisp Memorial Powwow is a festival highlight that presents American Indian music, dancing, demonstrations and crafts. Athens' Living Heritage Museum will hold its 30th quilt show and celebrate the opening of the Battle of Athens exhibit with a book signing by Steve Byrum at 2:30 p.m. Fuller's Frame Shop will host artist Lisa Bell, who makes artwork from your pet's paws and sells the work to benefit the McMinn Regional Humane Society. Nermin Begovic plays the "Beer Barrel Polka" inside the First Tennessee Pavilion at last year's Oktoberfest at Chattanooga Market. However, before getting your pet's paw painted, enter your canine buddy in the 10:30 a.m. Mutt Strut and pet costume contest. » Break out your lederhosen and dirndl skirts; it's Oktoberfest at Chattanooga Market on Saturday and Sunday. Bring the family to enjoy German food, oompah music from the Wurstbrats and polka dancing — and maybe work in a chicken dance before you leave. Oktoberfest includes a biergarten featuring 99 local and seasonal craft brews. Saturday's festival will culminate with the crowning of Mr. and Ms. Chattanooga Oktoberfest that evening. New this year: Oktoberfest Chattanooga Challenge bike ride. Riders may choose between a full 100-mile century or a 50-mile half-century route.